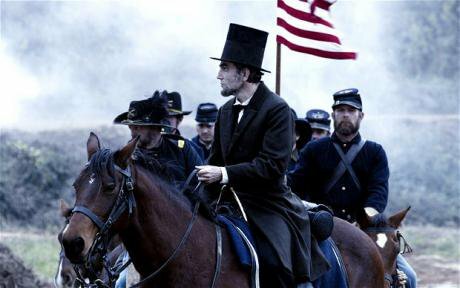 Daniel Day-Lewis in Steven Spielberg’s (2012) ‘Lincoln’. Fair use. Campaigners and governments leading the fight to end ‘modern-day slavery’ regularly appeal to the history of anti-slavery to help justify their current activities and agendas. These appeals to history typically involve one or more of the following: 1) a selective focus upon mostly white anti-slavery campaigners in Britain and the United States; 2) a largely uncritical celebration of the virtues of ‘great emancipators’, such as William Wilberforce and Abraham Lincoln, whose personal examples are invoked as models to emulate; and 3) a recurring emphasis on innovative strategies used by ordinary citizens—petitions, boycotts, pamphlets—whose impact is held to have been politically decisive in securing ‘freedom’ for enslaved Africans. Anti-slavery campaigners are therefore chiefly regarded as “heroes [who] won great battles”, to quote Kevin Bales, and their inspirational historical example is put forward as a model that we should follow today. In a high profile speech in 2012, US President Obama declared that “Our fight against human trafficking is one of the greatest human rights causes of our time, and the United States will continue to lead it—in partnership with you. The change we seek will not come easy, but we can draw strength from the movements of the past.” If pioneers such as Wilberforce and Lincoln were able to end legal slavery, then what stops a new band of college students, churches, activists and public officials from ‘liberating slaves’ today? This superficial approach to history is flawed. It sings songs of praise for past anti-slavery efforts, yet does not seriously engage with the history of slavery or its legacies. Centuries of severe and systematic exploitation and abuse have too often been reduced to an abbreviated form of ‘pre-history’, whose main narrative function is to set the stage for the ‘moral triumph’ of abolition. As a number of our contributors demonstrate in more depth, millions of enslaved Africans played a fundamental role in both building the Americas and enriching Europe, while external demand for slaves drew parts of Africa into a political economy of violent enslavement. Prior to the early nineteenth century, forced migration from Africa to the Americas greatly outpaced migration from Europe. Enslaved labour not only constituted a key source of wealth and power, it also proved to be a core economic motor for the development of modern capitalism. To protect and maintain this system, slave owners and their allies developed elaborate institutions to both regulate and reinforce their property rights, including new forms of banking, contract, insurance and policing. They also devised self-serving racist theories to justify their privileges. This toxic combination of racism and economic interest created a system of slavery chiefly defined by extraordinary levels of physical abuse, psychological torment, and sexual violence. Enslaved Africans both resisted and endured these inhuman conditions. Resistance could take many different forms, with some of the most notable examples including shipboard uprisings crossing the Atlantic and numerous cases of flight and revolt upon arrival in the Americas. Slaves who escaped joined Maroon communities outside European control, such as Palmares in the seventeenth century, or travelled long distances to settle in ‘free’ communities such as Boston and Buxton in the nineteenth. Families and communities also emerged under the shadow of slavery. Slaves found ways to establish personal bonds, however fragile, and contributed to the evolution of distinctive forms of language, food, music, religion and culture. Historical patterns of resistance were fundamental to the anti-slavery cause, yet too many ‘modern-day abolitionists’ continue to imagine slaves as passive victims who benefitted from activism conducted by others on their behalf. This overlooks the crucial role of slaves and ex-slaves in challenging historical slave systems. This most famous example is the successful revolt of 1791 that paved the way for the foundation of the Black Republic of Haiti in 1804. Black generals such as Toussaint L'Ouverture and Jean-Jacques Dessalines won a series of decisive victories against English, French and Spanish armies, and thereby created an inescapable challenge to racist ideologies that held that blacks were inherently inferior to whites. When states in Latin America broke away from Spain during the early nineteenth century, slaves fought for their freedom in wars of independence. Decades later, as many as 100,000 slaves and ex-slaves fought against the Confederacy during the Civil War in the United States. According to a new body of research by historians such as Steven Hahn, the enlistment of slaves in the Union army can be best understood as part of a much larger slave rebellion, which saw slaves in the southern United States massively undermine slavery through their own efforts. Neither the legal abolition of slavery nor the official end of hostilities brought resistance to an end. Whenever slavery was abolished, former slave owners and entrenched elites made every effort to defend their privileges, thereby forcing former slaves to continue their struggle for rights and recognition. In the decades that followed legal abolition, former slave owners turned to other similar systems of labour exploitation, such as indentured, forced and convict labour. They also concocted new systems of racial dominance, such as the ‘separate yet equal’ duplicity of the Jim Crow era, which was in turn policed by the horrors of lynching. Extreme violence was often justified as ‘protecting’ white feminine virtue from the ‘uncontrollable’ sexual savagery of black men, while female black domestic workers continued to labour in white households under conditions often reminiscent of slavery. When Britain and France abolished slavery in 1834 and 1848, respectively, both governments financially compensated masters for the loss of their property. In no case did slaves receive compensation for their years of toil and abuse. These and other related developments ultimately contributed to global patterns of wealth, poverty, inequality and discrimination that remain with us to this day. Over the next three weeks we will publish a series of articles that explore these and other related historical themes in greater depth. All of these articles were specifically commissioned to explore issues and developments that have been overlooked or marginalised in the rush to celebrate the virtues of ‘great emancipators’. As we shall see, there is a great deal that the global history of slavery and anti-slavery can potentially teach us about how our world is organised today, while also suggesting possible futures and political projects that could—and should—emerge in relation to combating contemporary injustice, discrimination and exploitation. It should become apparent, moreover, that the global history of slavery and anti-slavery is much more than a useful source of instruction and inspiration regarding how we should act today. This history also speaks directly to the too often neglected question of how we should not act. Whenever the legal abolition of slavery is reduced to the ‘moral triumph’ of ‘heroic’ campaigners, little space remains for more challenging questions and political consequential questions regarding the practical limitations of what was accomplished, what happened next, and what other factors and actors were also in play. We begin with a series of articles focusing upon government responsibility. Every government in the world today is officially committed to the anti-slavery cause, yet this rhetoric conflicts with official support for legal regimes and policy responses that promote forms of systemic abuse, vulnerability, discrimination and exploitation. This is not a new phenomenon, as histories of the Communist gulag, Nazi work camps and colonial forced labour regimes have helped make clear. In our lead article published today, Jim Stewart explores how US government officials were not only directly responsible for upholding legal slavery and slave trading, they also occupied a similar role in the aftermath of legal abolition in 1865, with both federal and state level officials playing a decisive role in defending ‘slavery by another name’. Stewart argues that this history has far-reaching ramifications for the present, but it has been largely overlooked owing to the failure of ‘modern-day abolitionists’ to grapple with slavery and race. Our first week on government responsibility also features contributions from Alex Lichtenstein, Genevieve LeBaron, Laya Behbahani, Benedetta Rossi and Sara Farris. Both Lichtenstein and LeBaron concentrate upon the historical roots and contemporary dimensions of the US ‘prison industrial complex’. Each author offers a different yet complimentary analysis of the underlying interests of governments and their private sector allies in perpetuating and profiting from prison labour. Behbahani considers the historical origin and more recent evolution of the kafala system, which is the current foundation for the state-sponsored exploitation of millions of migrant labourers across most of the Arabian Peninsula. This is followed by an original contribution by Rossi, who connects the failure of historical anti-slavery measures in Africa to confront entrenched models of marriage, gender and kinship with more recent patterns of wartime captivity and sexual violence. We wrap up our first week with Farris, who reconstructs the frequently overlooked history of care and domestic work as an integral feature of state-sponsored capitalism during the eighteenth and nineteenth century. Our second week focuses upon patterns of historical and contemporary political activism and intervention. We begin with two complimentary pieces from Jessica Pliley and Gretchen Soderlund, who consider different aspects of the history of anti-trafficking campaigns in the United States. As a now extensive body of research has demonstrated, the key historical precursor to modern anti-trafficking was not anti-slavery, but the political campaigns against ‘white slavery’ and the patriarchal policing of prostitution. Pliley connects ‘white slavery’ interventions to concerns about national security and immigration. She demonstrates that gendered assumptions about potential prostitutes were a central feature of a massive government effort to regulate female mobility and sexuality. ‘White slavery’ was therefore crucial to the growth of the FBI and other security agencies. Soderlund, in turn, focuses upon the ‘continual feedback loop’ that binds together sensational media reports and political activism in the 1880s to similar reports that have been key to anti-trafficking activism from the 1990s onwards. This second week on political activism also features additional contributions from Andrea Major, Nelly Schmidt, Joel Quirk and Alice Bellagamba. Major and Schmidt both focus on the practical limitations and political complications that marked the history of British and French anti-slavery activism. Major’s contribution demonstrates the limitations of a celebrated boycott of ‘slave sugar’ by British abolitionists during the late eighteenth and early nineteenth centuries, along with the practical problems associated with ‘ethical’ sugar produced in India. Schmidt’s piece—published simultaneously in English and French—explores the problematic attitudes and political agendas that defined the historical worldview of nineteenth century French abolitionists, together with recent forms of memory and forgetting. We end the week with pieces from Quirk and Bellagamba. Quirk compares the political and ideological appeal of ‘modern-day slavery’ to recent campaigns for reparations, while Bellagamba examines the contemporary legacies of historical slave systems in southern Senegal. She pays particular attention to the ways in which boundaries of community amongst slave descendants have been constructed. Our final week focuses upon the contemporary legacies of historical slave systems. The primary concern is the politics of representation, recognition and reparations. We begin with two pieces from Ana Lucia Araujo and Ali Moussa Iye. Araujo’s contribution asks how and why recent efforts to commemorate the past continue to intersect with the enduring legacies of slavery in countries such as the United States and Brazil. Another valuable perspective on this overall topic comes from Iye, who documents the numerous ways in which the UNESCO Slave Route Project—established in Benin in 1994—has sought to address the global history and legacies of slavery. These authors are followed by pieces from Taiwo Adetunji Osinubi, who explores how African writers have represented the history of slavery and abolition, and María Elisa Velázquez, who considers the continuing challenges that peoples of African descent face in Latin America today. Our final piece comes from Claudine Boothe and Nathaniel Adam Tobias Coleman, who discuss the politics and history of various calls and campaigns to repair the wrongs of the past.